Jim is the world’s leading global futurist, trends and innovation expert, with a massive global blue chip client list. Over the last 20 years, more than 2 million people have shared his insight with his events on stage. Jim helps transform growth-oriented organizations into high-velocity innovation heroes! Jim assists in organizations in dealing with the future, trends and innovation through three distinct types of events: As a keynote speaker, panelist, or workshop facilitator. Jim specializes in speaking at corporate round tables with business leaders. As Jim will discuss, we have seen more change in the last 5 years than we have seen in the last 100 – and yet there is much more yet to come. But with economic, political, career and business model volatility all around us, it’s all too easy to fall prey to a swirl of negative thinking — with the result that you lose sight of the fascinating opportunities from what comes next. The best antidote? An uplifting, hopeful and motivational view into the future with futurist Jim Carroll. Jim is one of the world’s leading global futurist, trends and innovation experts, with a massive global blue chip client list. 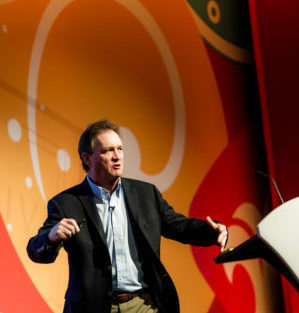 Over the last 20 years, more than 2 million people have shared his insight at his events …..clients include NASA; Walt Disney Corporation; PGA of America; Wall Street Journal; DuPont; The GAP; Siemens; Lockheed Martin; Swiss Innovation Forum; Fairmont/Raffles Hotels International; RGA Reinsurance; National Australian Bank; CIGNA; Pfizer; Johnson & Johnson…. topics cover future trends and innovation … sample keynote topic “Think Big, Start Small, Scale Fast: Innovating in the Age of Acceleration” … he has shared the stage at events with Leonard Nimoy (“Spock” of Star Trek), President George W. Bush, Carrie Fisher (“Princess Leia” of Star Wars), Terry Bradshaw of the NFL, Biz Stone (Founder of Twitter), Jimmy Wales of Wikipedia, Astronaut Scott Kelly (last pilot of the Space Shuttle), Buzz Aldrin of Apollo 11, Jack Welch of GE, Roger Goodall, the Commissioner of the NFL, Lee Trevino and Bubba Watson of golf, among others … Jim assists in organizations in dealing with the future, trends and innovation through three distinct types of events: as the opening or closing keynote speaker for the annual meetings/conferences of national or international associations; keynotes or workshops for private corporate leadership events; or keynotes or panel discussions on customer oriented meetings or promotional events…. BusinessWeek on Jim: “a leading source for innovation insight;” CNBC guest expert on innovation; insights also covered by ABC News, INC, Fast Company, the South China Morning Post (Hong Kong), STOrai Magazine (Retail Association of India), The Age (Sydney, Australia), American Way, CAPITAL Magazine (Dubai/United Arab Emirates) CEO Magazine Hungary, Association LEADERSHIP, the National Post and PROFIT. Plus, he’s a really nice guy and fun to work with! We have seen more change in the last 5 years than we have seen in the last 100 – and yet there is much more yet to come. But with economic, political, career and business model volatility all around us, it’s all too easy to fall prey to a swirl of negative thinking — with the result that you lose sight of the fascinating opportunities from what comes next. The best antidote? An uplifting, hopeful and motivational view into the future with futurist Jim Carroll. In this engaging, humorous and yet powerfully refreshing keynote, he takes you on a tour of the trends which are reshaping our world in a great way. A renaissance in manufacturing enabled by 3D printing, advanced robotics and massive digitization, self-driving cars, space tourism, asteroid mining, vertical farming, and other fascinating fast paced trends. Opportunities for the transformation of entire industries such as healthcare, sports and transportation through unprecedented levels of hyper-connectivity. The acceleration of ideas with science that are allowing us to solve some of the biggest challenges of our time in the world of education, healthcare, the environment and education. A generation of millennials who know that it is a great time to think big ideas and do great things with their boundless enthusiasm and global awareness. It’s time to turn your mind to the future once again, restore a sense of hope and optimism, and link yourself to the fast paced trends which energize your outlook on opportunity! Business model disruption. The rapid emergence of new competitors. The challenging impact of social media. Rapid prototyping and the global idea machine. The digitization of everything and the impact of hyper connectivity. Rapid technological change. For over two decades, Jim Carroll has been assisting organizations and high-caliber leaders position themselves for a future in which the velocity of change is the new normal, acceleration is the reality, agility is the core, and adaptation is the reality. World class innovators possess a relentless focus on growth, continually transitioning their revenue source, and solving customer problems before the customer knows it’s a problem. They focus on upside down innovation by sourcing innovation ideas through their customers. They concentrate on ingesting fast ideas; checking their speed and focusing on corporate agility; and focusing on long term wins through constant incremental improvements. They know that skills partnerships are a key success factor. Most importantly, world class innovators aren’t afraid to back away from big ideas. They know that right now is a great time to made bold decisions, and to take decisive advantage to forge aggressive new paths against their competitors. We live in a time of massive challenge, and yet one of massive opportunity, with every industry and organization impacted by business model disruption, the emergence of new competitors, the impact of technology, the collapse of product lifecycle, political volatility and ever-more challenging customers. Those very things which might have worked for us in the past might be the very anchors that could now hold us back as the future rushes at us with ever increasing speed. In the era of Uber, Tesla and Amazon, leaders must have the insight into unique opportunities for innovation and change. Futurist Jim Carrol provides a customized overview of the key trends impacting your organization, and invaluable leadership lessons that provide a clear path for going forward. We will see more change in the next 5 years than we have seen in the last 100. People and organizations are scrambling to align themselves for a new, topsy-turvey world. Jim Carroll comes to the rescue with his keynote, The Masters in Business Imagination which will inspire your team to adopt relentless creativity and innovation as core virtues. Once you ‘graduate’ from his MBI class, you’ll possess the skills common to this critical degree of the 21st century economy. MBI’s see things differently – they don’t look at things like most people. MBI’s spur creativity in other people – they inspire others to develop similar levels of imaginative thinking. They focus on opportunity – not threat, and realize that action, not inaction, is the driving force for the future. They refuse to accept the status quo and are prepared to eliminate habit. MBI’s bring big ideas to life – and paint pictures of where the organization is going to go, rather than focusing on where it has been in the past. They learn and unlearn, forgoing the dangerous assumption that what they know today will carry them into tomorrow. Most important of all, they refuse to say the word CAN’T – they know that barriers, perceived or otherwise, are simply temporary roadblocks that they can get around with fresh insight, imaginative analysis, and creative thinking! The Internet of Things is a substantive, transformative trend that will provide more change in every industry in the next ten years than they’ve seen in the last thirty. Jim Carroll already has over a dozen years of on-stage experience with the topic, and can help you understand the strategies, risks and opportunities that you need to be aware of as you move into a hyperconnected future. Aligning Acceleration & Agility: The Business Case for Fast! In this keynote, Jim Carroll takes you on a voyage into how the new rules of business and technology are providing for a reality in which the spirit of agility isn’t just an option – it’s the new normal. When Jim Carroll began a recent keynote talk for the Minnesota Hospital Association CEO Summit, he announced that he wouldn’t even mention health care reform — and the audience of 300 senior executives cheered! Instead, he told the audience that he would take them on a voyage to the world of health care in the year of 2020, and provide them the insight they really need to deal with the challenges and opportunities of the future. Everyone in a leadership position in the US health care system knows that even with health care reform, the challenges facing the US health care system are substantial and immense. That’s why innovation has quickly come to be one of the top issues that senior health care executives and medical professionals are thinking about. There is a realization that there is an urgent need to challenge the very philosophies upon which the system is built. They’re seeking insight into the major scientific, technological, consumer and social trends that will, by the year 2020, allow for some very dramatic changes in the concept of health care delivery. The fact is, we are going to witness more change in the world of health care in the next ten years than we have seen in the last 200. For the last fifteen years, Jim has been providing his guidance into future trends to a wide range of global Fortune 1000 companies, associations, and other groups. In his Healthcare2020 keynote, Jim puts into perspective why innovation is no longer just a fashionable phrase — it’s the critical new leadership focus for executives in the health care sector. Jim has captivated management teams and health care professionals in keynotes for major US health groups such as St. Joseph’s Health System, Blue Cross Blue Shield of North Carolina, Cardinal Health Care, Providence Health, Harvard Pilgrim Health Care, the Association of Organ Procurement Organizations, and the American Society for Health Care Risk Management to name but a few. He was the closing keynote speaker for the 4th Annual World HealthCare Innovation and Technology Congress in Washington DC, which featured a virtual who’s who of the health care scene in the US today. Jim Carroll, an agriculture futurist and innovation expert, will look into his crystal ball and predict what agriculture will be like in 2045. Whether it’s driverless tractors, weed-zapping robots or data-transmitting crops, Jim will forecast what farms might be like 30 years from now, and encourage the industry to embrace high-velocity innovation. Jim is recognized worldwide as a “thought leader” and authority on global trends, rapid business model change, business transformation in a period of economic uncertainty, and the necessity for fast-paced innovation. You will not want to miss his predictions. Many people continue to view farming from the sepia-toned photos of the 1940s and 1950s. They don’t realize the technological and scientific advances or the massive opportunities for international growth. Growers that focus on innovation as a core value will find success; their innovation will focus on the triple-feature need for growth, efficiency and ingestion of new science. It will be by adopting new methodologies, products, partnerships and ideas that they will learn to thrive. Jim is recognized worldwide as a “thought leader” and authority on global trends, rapid business model change, business transformation in a period of economic uncertainty, and the necessity for fast-paced innovation. Some of Jim’s agriculture clients include the global agricultural powerhouses of FMC Agriculture, Monsanto, Pioneer, Syngenta…. In addition, he has provided keynotes for • CHS Cooperative • Farm Media Journal • Texas Cattle Feeders Association • Colorado Cattle Ranchers Association • FCC Services US (Farm Credit Cooperative) • MicroBeef Technologies • Mid-America Crop Protection Association • FarmTech • AgProgress Conference • Agricorp • CropLife Canada • US Department of Agriculture • American Agriwoman Society • American Landscape and Nursery Association • United Soybean Board • and more…. .
His keynotes feature up to date insight based upon extensive research. Jim spent so much time customizing the presentation for one agricultural conference that at the conclusion, one fellow came up and asked him how long he had been a farmer! In the face of widespread economic volatility, organizations have three essential choices: they can panic, making rash decisions on structure, markets, and investments; they can freeze and do nothing; or they can respond to rapid change through innovation, particularly with respect to strategies, structure, capabilities, markets, products, and activities. Many CEO’s and senior executives understand that in addition to managing existing challenges, now is the time to focus on trends and the future, and that they need to act quickly to establish an innovative mindset to get there intact. Jim shares his insight on the strategies that leading edge organizations are pursuing to stay ahead of the economy. Through his signature keynote addresses, after-dinner talks, discussions at small intimate management/board meetings, or by speaking and participating in large scale senior management and leadership meetings, Jim provides his unique insight on staying ahead in volatile times. It’s timely and critical insight! Where will we be in 2015? 2020 or 2025? What challenges and opportunities will we face? In a world of massive globalization, what will our markets, customers, industries and organizational structures look like? These are truly transformative times, with an alignment of political leaders, business executives, consumers, researchers and industry groups all realizing that now is the time that we need to solve complex problems with bold thinking and “big ideas.” Some of the biggest organizations in the world – including Blue Cross Blue Shield, Toshiba, the Swiss Innovation Forum, the BBC, Motorola and Nestle – have sought just such insight from Jim Carroll. As someone who has assisted hundreds of organizations in thinking about and preparing for the future, Jim has become globally recognized as one of the world’s leading international futurists. In a highly customized presentation, he outlines the major trends that will impact you, and what you need to start doing now in order to respond. He will open up your mind to the opportunities of this transformative time – a new era when big ideas and bold actions are proving to be the foundation for significant transformation in how we approach global challenges, problems and opportunities. In doing so, he will ensure you are well positioned for the future! Join international futurist, trends and innovation expert Jim Carroll as he explores some of the biggest challenges facing organizations today. With the coming “end of retirement,” most companies will come to realize they’ll need a lot of telephones with big buttons for members of the 70+ folk who are still a part of their workforce — and a lot of innovative workplace practices as well. That’s but one challenge. The arrival of “Gen-Connect” (also known as “Gen-Y”), the kids who have been wired with a mouse since birth, into the work force will lead to the question of whether “good luck” will be the only possible response to the question of “Managing Gen-Y.” This workplace weirdness will only be compounded by the ongoing rapid evolution of knowledge and skills, such that most organizations will find it impossible to find the highly specialized skills needed in the economy of the future. Are we really in an economy in which there is an emerging profession of folks known as “manure managers?” You bet — and it’s all part of the unique issues that companies must begin thinking about today. Jim’s unique insight into emerging HR trends is in high demand – 3,000 members of the International Human Resource Information Management Association recently heard him put the issues in context on stage in Dallas, Texas. Join Jim as he shares his insight into the trends that you are already faced with, and the innovative and creative ways that you can come to grips with the depth of the challenges ahead.